Mujeeb Ur Rahman, the 17-year-old off-break bowler from Afghanistan, has been signed by Middlesex to play in next season’s T20 Blast, which gets underway on July 18. It was also the franchise’s first signing of the summer and he would be available for the entire season. The Khost-born is expected to join the team early in July to get himself prepared for the T20 tournament. 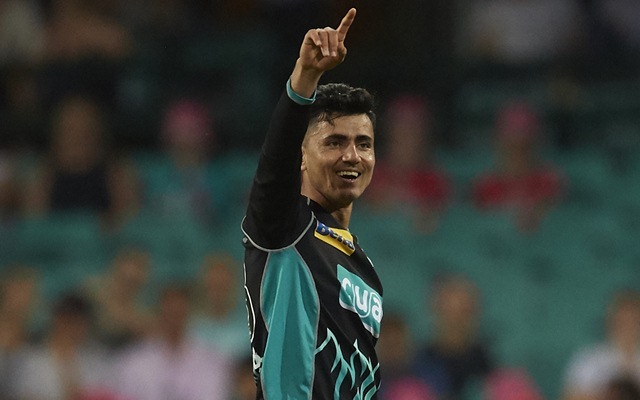 Mujeeb recently played for Brisbane Heat, captained by Chris Lynn, in the Big Bash League (BBL). In the tournament, he was one of their most successful bowlers with 12 wickets from as many matches. The tweaker also had an economy rate of 6.04 with the best figures of 3/16. Meanwhile, Stuart Law, Middlesex’s Head Coach, was over the moon after drafting Mujeeb in for the T20 event. “It is with great pleasure to say that Mujeeb has agreed to play for Middlesex in the Vitality Blast. His unique style of spin has proven to be difficult to play against and his record is outstanding in this format. I’m sure the staff and players at Middlesex are looking forward to working with him this season,” Law was quoted as saying in Middlesex Cricket’s official website. Mujeeb also sounded excited for the journey and is looking forward to playing at the renowned Lord’s Cricket Ground, Middlesex’s home ground. “I’m very pleased to sign for Middlesex for the Vitality Blast and it will be very exciting to play at Lord’s again. I hope we can be successful as a team,” the 17-year-old mentioned. Middlesex had a horrendous season last time around as they finished at the bottom of the points table in the South Ground. They could only manage a couple of wins out of 14 matches and also had the worst Net Run Rate among the nine participating teams in the group.